Cézanne made only eight prints during two distinct periods of his career. The first was in 1873 in the company of his Impressionist colleagues, Camille Pissarro and Armand Guillaumin. The incentive to explore the medium of print- making came from Dr Paul Gachet, a dedicated amateur etcher and physician, famous for having treated Vincent van Gogh. Gachet had set up a printmaking studio in the attic of his house at Auvers-sur-Oise, and it was on his private etching press that he printed the five small plates that Cézanne had hastily sketched, as well as those by Pissarro and Guillaumin. When the artists parted company, Cézanne showed little interest in ever taking up the medium again. More than two decades later, in circumstances defined by commercial imperative rather than private experimentation, Cézanne was prevailed upon by the most influential contemporary art dealer in Paris, Ambroise Vollard, to try his hand at lithography. Cézanne and Vollard had forged their relationship in 1895, when the latter staged a ground- breaking exhibition of the painter’s work at his gallery in the rue Laffitte. Cézanne was still largely unknown in Paris at this time and the exhibition established his reputation. Vollard was a central figure in the resurgence of print- making in the 1890s. He championed the newly fashionable medium of colour lithography, which had undergone a series of technical refinements and was emerging as an important medium of avant-garde innovation. In 1896 and 1897 Vollard published two albums of miscellaneous prints by various contemporary artists, with a third one projected (but never realised) for the following year. Cézanne’s lithograph, Large bathers, was commissioned for this aborted project. Cézanne, like many of the artists commissioned to produce works for Vollard’s albums, was not a born printmaker: he had little experience working with the medium, let alone of the technical complexities involved in colour lithography. Thus the technical aspects of the process were entrusted by Vollard and Cézanne to the master printer Auguste Clot. To make the Large bathers, Cézanne first created a lithograph in black, completely delineating the forms of the composition. After a number of impressions had been printed, he coloured them with watercolour. These then served as models or maquettes to guide Clot in preparing the colour lithographic stones, which would faithfully replicate Cézanne’s colour effects. Three such impressions with the artist’s hand- colouring are known. The one now in the National Gallery of Canada, Ottawa formed the model for the printed editions. Douglas Druick has shown that the Large bathers was issued in two editions, each printed by Clot from a different set of colour stones: the first was printed from six stones (ochre, blue, green, yellow, red, orange) and the second from five (ochre, blue, green, yellow, red). Both editions comprised about 100 impressions. Furthermore, the two editions can be distinguished by the presence of a printed inscription on first-edition impressions: Tirage à cent exemplaires No / P. Cézanne. The Gallery’s impression is from the second edition. In the mid 1870s Cézanne painted his first works on the theme of bathers, a subject that interested him increasingly thereafter. His male bathers, in particular, recalled his boyhood days spent swimming with friends in Aix-en- Provence. Cézanne sketched bathers in various poses and repeated them from one composition to another, constantly exploring the problem of integrating the human form with the landscape. The figure on the right of the print is copied from a Roman sculpture of Hermes fastening his sandal that Cézanne saw in the Louvre. 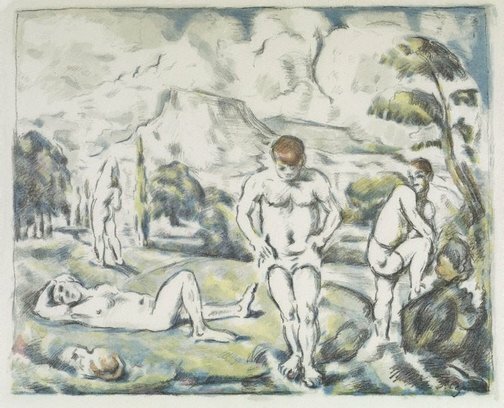 The composition of this lithograph is based on Cézanne’s painting of 1876/77 titled Bathers at rest (Barnes Foundation, Philadelphia), which was shown at the third Impressionist exhibition in 1877. As in the oil, the print depicts four male figures in a Provençal landscape, with Mount Sainte-Victoire in the background. Signed l.r., [printed] black ink "P. Cézanne". Not dated. Douglas Druick, Cézanne: the late work , 'Cézanne's lithographs', pp 119-137, New York, 1977. Great collections , Sydney, 2008, col illus p 96. Important works on paper and sculpture , 2004, col illus cover. L’œuvre gravé de Cézanne, bulletin no 82 , Marseille, 1972, pp 68-69. Look , 'The beauty of Cezanne's drawings', Sydney, Dec 2008-Jan 2009, col illus p 13. Prints & drawings Europe 1500-1900 , Sydney, 2014, p 184, col illus p 185.